International education remains Australia’s third-largest export sector and the only non-resource sector in the top five. International education activity contributed an estimated AUS$15 billion to Australia’s economy in 2013 – a 3.8% increase over 2012 but still shy of the previous high of AUS$16.1 billion in 2010. In line with this strengthening economic impact, Australia reversed a three-year enrolment decline in 2013, registering a modest increase of 2.6% in total international student numbers and a much more noticeable bounce (9.3%) in student commencements for the year. It now appears that those promising 2013 results may have been the beginning of a longer-term growth trend. The latest figures from Australian Education International (AEI) for year-to-date through May 2014 paint a convincing picture of a strengthening enrolment base for the country. There were 404,909 full-fee paying international students in Australia on a student visa, representing a 10.1% increase over the same period for 2013. The average growth for the same period over the previous ten years is 4.6%. There were 170,269 commencements through May 2014. This adds up to an 18.4% increase over the same period for 2013, and a notable bump over the average annual growth rate of 4.6% recorded over the previous decade. 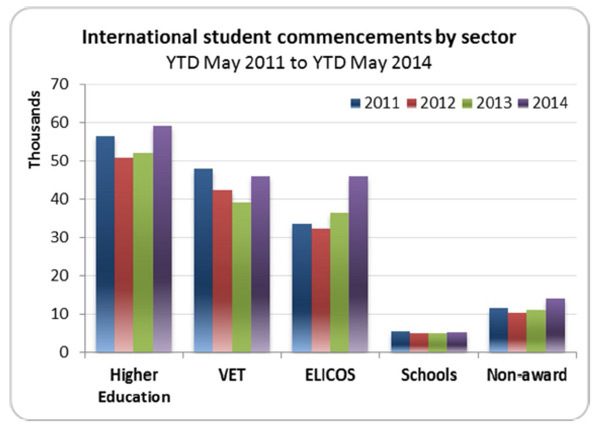 Higher education accounted for the largest volumes of both enrolments (49.3%) and commencements (34.7%). Higher education enrolment is up 6.4% YTD May 2014, and commencements grew by 13.6%. Vocational Education and Training (VET) enrolments and commencements grew by 5.9% and 18.0% respectively over 2013. English Language Intensive Courses for Overseas Students (ELICOS) recorded the largest growth rates over 2013 with a 26.7% jump in enrolment and 25.6% in commencements. Five source countries accounted for 52.7% of Australia’s international enrolment across all sectors. China and India are the big drivers in higher education enrolment, representing 38.4% and 9% of total student numbers in the sector respectively. When it comes to VET enrolment, the top countries are India (18.6%), China (9.9%), South Korea (7.8%), and Thailand (7%). Meanwhile, China is again the top source country for ELICOS providers (22.6% of enrolments), followed interestingly by Brazil at 9.3% and Thailand at 8.9%. 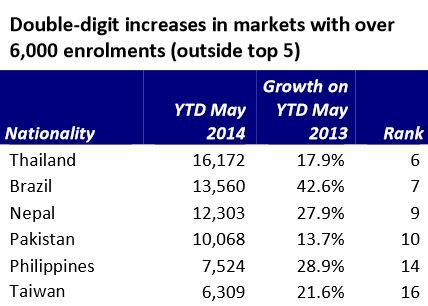 Foreshadowing further diversification in the enrolment base going forward, several countries outside of Australia’s top five markets registered double-digit growth YTD May when compared to the same period for 2013, as the graph below illustrates. Given the pathway aspect of ELICOS programmes – that is, that many of the students following ELICOS courses in Australia will go on to further education in VET or higher education – the strong growth and changing enrolment base in Australia’s English language centres is particularly noteworthy. This time, however, “it’s higher education packaging,” said Sue Blundell, executive director of English Australia. The shift is attributed in part to the streamlined visa processing (SVP) provisions for university-bound students, a model that the Australian government began to expand in late-2013 to include an initial group of non-university providers. “Under the streamlined student visa processing arrangements, eligible student visa applicants from participating universities and eligible non-university higher education providers are assessed as though they are a lower immigration risk, irrespective of their country of origin,” says the Australian Department of Immigration. Most recently, Education Minister Christopher Pyne announced in May 2014 a further expansion of SVP provisions to include students enrolled in advanced diploma programmes with institutions in the higher education and VET sectors. This entry was posted in Australia, Australia/Oceania, Higher Education, Language Learning, Regions, Vocational and tagged student visas, study abroad, student recruitment, secondary schools for international students, higher education statistics.